Fantasy or fact, truly believed or doubted or manufactured, big cat scares have for generations haunted south-eastern Australia. The notion that a big cat has escaped and is at loose, or that the thylacine survives, is exciting and we may wish it to be true; it seems just possible. An ancient landscape of crags and lava cones and endless forbidding bush plays with the mind and is a dramatic backdrop for folklore. Stories of stock kills and claims of paw-prints have some kind of foundation; rumours of 'beast' attacks feed a persistent mythology. Stories of big cats roaming the Australian bush, and in particular the southeast corner of the continent, have been around for more than 50 years. Some cases are quite famous, such as that of the Tantanoola Tiger from the 1890s, while others have fallen into folklore largely forgotten. In the early 1940s there was the story of American servicemen releasing pumas that had been mascots in the Grampians. More recently, there have been many reports of sightings and clearly faked photographs. Well-documented stock kills which could not be attributed to dogs have kept the store alive. Prior to the last state election, under pressure from some elements of the farming community, the Liberal-National coalition promised an investigation into the big cat issue, and this resulted in a 'desktop' study being carried out. The results concluded that there was no irrefutable proof that big cats lived in the Australian bush, but conceded that there were many unanswered questions that needed much further investigation. It was a predictable outcome, given that no specimen, skin, skeletal material or clear DNA evidence proves that the animals are here. Now, two researchers have published a book, Snarls from the Tea-tree, in which the history of big-cat sightings has been meticulously documented, and "the evidence" - in the form of unusual animal kills, foot-prints, scats and other indications that big cats are here - is assessed. Unlike other books on the subject, this is not biased towards a conclusion in favour of the big cat theory, but approaches the subject from a historical and factual perspective, and summarises what is needed to prove the issue one way or the other. The data presented by Simon Townsend, one of the authors, is compellilng in support of the case for the presence of big cats, while David Waldron has compiled reports of big cats and other exotic fauna sightings from the very early days of European settlement in Victoria. One of the questions most often asked is in regard to the origins of the cats (if, in fact, they exist). As Waldron points out, early in colonial times it was not uncommon for wealthy squatters and others to establish menageries that featured lions, tigers and other large felines - the "black panther", actually a melanistic form of the leopard, was a popular acquisition. There was always the possibility of these animals escaping. Then there were the pumas allegedly released in the Grampians in the 1940s. But could these accidental and deliberate releases account for an existing population 70 years and more later? This implies many generations of animals coming from a tiny and diverse - in time and location - population base. The other issue is that we are talking about two distinct species. Do we have both pumas and leopards (panthers) in the bush? It is a fascinating subject that Waldron, a lecturer and researcher in anthropology and history at the University of Ballarat, and local big-cats researcher Mr Townsend, have combined to investigate in a thorough and very thought-provoking way. I recently had the privilege of attending the launching of a new book. Hosted by Ballarat Books, this event featured co-authors Dr David Waldron and Simon Townsend with Snarls From the Tea Tree. For the past 150 years Victoria’s bushland has been haunted by the myth of large cat like predators stalking the wilderness, feeding on stock and leaving stories in local folklore and mythology. Snarls from the Tea-Tree traces the development of the story from its origins in the colonization of Victoria to the present day and explores the themes, legends, claims and context of this deeply pervasive urban legend in rural Victoria. Dr David Waldron is a lecturer in History and Anthropology at the University of Ballarat. Simon Townsend is a veteran big cat researcher and co-founder of Big Cats Victoria. The surprising thing about “Snarls”, given the folk-lore about big cats that permeates South Eastern Australia is that it is the first authoritative compilation of all of the available documentation into one volume. Snarls From the Tea Tree represents a prodigious gathering and sifting of source material. It is also presented in a very readable style. The authors demonstrate the regularity with which Big Cat scares have re-occurred since the mid 1800s, and the seriousness with which they have been explored. The reader may be surprised to learn that certain escapes and releases of zoo and circus big cats into the bush from time to time are attestable facts; that dingos, feral dogs and cats and mainland thylacines have been postulated as the true culprits of big cat attacks on livestock and wildlife; and that acceptance of the big cat phenomenom has more than once been used as a smokescreen for illegal activity. Several years ago, an envelope arrived at my former address, containing photographs of animals which gave every indication of having been killed by a big cat. A quick bit of research indicated that the sender, a certain Simon Townsend, was empoyed in the Victorian branch of the same government department as me. He was most surprised when I pointed it out. Since then, we have been retired, but he has kept up his interest in the topic, and has now collaborated with Dr David Waldron on a new book. This is about alien big cats in Victoria and the adjacent parts of South Australia. A couple of areas in other states are mentioned, but not Western Australia. Although the subject is of major concern for cryptozoology, it is not a regular cryptozoological book as such. You will not find a proposition, evidence, or a conclusion. Rather, it is a history and analysis of the phenomenon, and advice on dealing with it. There are 168 pages of text, eight photographs, four pages of index, and 400 end-notes, the greater part being of not-easily-assessible newspaper reports. Whatever else may be said about the book, it cannot be faulted for lack of documentation! Dr Waldron is a lecturer in history and anthropology at the University of Ballarat. Simon Townsend, as well as being a former public servant, is an ex-zookeeper, and a former researcher for Rare Fauna Research. Currently, he operates the website, Big Cats Victoria. Understandably, therefore, they approach the subject from two different perspectives. The first three chapters are by Dr Waldron. 1. Monsters in the Scrub: the 19th Century. Most of those currently working in the field are aware of the situation only for the last few decades. Here, the author takes us back to the beginning, to the social situation: the alien nature of the Australian bush to the early settlers, the expectation of fauna similar to that of the Americas or Africa, and the final realisation of the truth. Then, in the second half of the century, came the acclimatisation societies, with their introduction of rabbits, deer, and foxes, and the proposed introduction of such animals as alpacas and monkeys, which somebody seriously suggested letting loose in the bush. At the same time, there was the virtually unrestricted importation of exotic animals for public and private menageries. (Have you heard about the 1859 case of "an escaped tiger on Little Bourke Street in Melbourne pursued by members of the Chinese community to the merriment of European onlookers"? [p19]). In South Australia in 1880s, there were constant references to stock killings by unknown predators, leading to the famous Tantanoola Tiger panic of 1892-5. It sounds like a three ring circus now, with widespread stock losses, the rumour of an escaped tiger, various colourful sightings, organised hunts, government action, and finally the killing of a large dog, believed to have been the ultimate cause. Even after that, some criminals decided to use the legend of a super-predator as a cover for widespread stock theft. 2. Gippsland Panthers and Mascot Mayhem. Dr Waldron sees the Tantanoola Tiger as the beginning of a pattern involving the psychological aspect of the alien bush impinging on the cultivated lands, economic depression, and widespread stock losses leading to panics over alleged alien predators, each time culminating in the killing of a large, aberrant dog. He provides a long series of such panics, far too many to list here, mostly in Victoria, but also the Yengarrie Lion in Queensland. All this was against a backdrop of floods, Depression, stock losses, and war - the latter introducing a mania for military mascots. In fact, one returning troopship searched by Customs, was found to contain 1,650 (!) illegal animals on board, including a deer and a bear cub [p58]. 3. The Grampians Puma and the Otways Panther. This chapter brings the history up to date, and it is probably the only history known by current "big cat" investigators. The author strays out of Victoria to document the famous "Emmaville Panther" of New South Wales and, a quarter of a century after the event, solves the mystery of the lioness shot near Broken Hill in 1985. However, the main action remains in Victoria, with two trends coming to the fore. The first is the generally accepted origin myth of the alien big cats as pumas introduced as mascots by U.S. airmen. The other is the culture war between cryptozoology and official skeptical societies, which lumped it in with UFOs, fairies, clairvoyance, even religion - everything, in fact, which they didn't believe in, despite the very different natures of the phenomena in question. This was matched in the rural areas of Victoria in the division between true believers and true unbelievers, many of which had a strong emotional investment in a particular point of view. It also details the investigations by cryptozoological bodies, universities, and government bodies. Indeed, there is so much detail in this chapter that it is impossible to summarise it fully. As a folklorist, Dr Waldron is concerned with the development of patterns of belief in alien big cats, rather than the validity of these opinions. This is left to the second author, Simon Townsend. 4. Cryptozoology: What's in a Name? This chapter is essentially an introduction to cryptozoology. 5. Field Signs, Kills and DNA Testing. Here Mr Townsend provides an excellent review of the sort of evidence available, or potentially available, in the investigation of alleged alien big cats. From the discussion, and the endnotes, it is clear that he has done his homework exceedingly well. He delves into tracks, drag marks, territorial markings, denning sites, kills, and sightings and photographs, at all stages outlining the ambiguities of the evidence, and the known problems with eye witness testimony. From there, he discusses in detail the suspects, ranging from the least likely to the most banal. Finally, he discusses the techniques necessary for proper investigation. Notably, he proposes no solution, although he is sympathetic to the big cat hypothesis. Finally, there is a short concluding chapter by David Waldron. Minor Criticisms. The name of the father of cryptozoology, Dr Heuvelmans occasionally gets misspelled. There is a really bad misspelling of the scientific name of the brush-tailed possum on p 133, and in chapter 3 there is a tendency for capital letters and full stops to drop out. Also, although when the second author cites zoological names, he correctly capitalises the generic name (the first name), the same cannot be said of the first author. This is a common mistake among non-biologists, but an inconsistency like this is a reflection on the editorial proof-reader. Who should read it, bearing in mind that Australian publications usually remain available for only two or three years before being remaindered? Well, since the subject is a major point of contention in rural Victoria, I think every rural library should stock it. Wildlife zoologists should definitely read it, if only to find out what people are saying. Also, because the book does not back any specific conclusion, they need not fear they are being "got at" by pseudo-scientists. Outside Victoria, those interested in crytozoology, or alien big cats in general, will also find it informative. Where to, next? It would be interesting to see a similar study performed on big cat lore in other parts of Australia, especially Western Australia, which was not included in the book. The social milieu behind big cat lore in the United Kingdom and the United States would also be of interest, because it is likely to be quite different to that of Australia. Gratitude is owed to my stepdaughter, Melissa and her husband, David for providing this book as a Christmas present. Snarls from the Tea-tree. 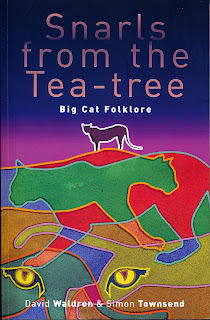 Big Cat Folkloreby David Waldron and Simon Townsend (2012), Australian Scholarly Publishing, availablehere. Dr Waldron is a lecturer in history and anthropology at the University of Ballarat. Simon Townsend, as well as being a former public servant, is an ex-zookeeper, and a former researcher for Rare Fauna Research. Currently, he operates the website,Big Cats Victoria. Understandably, therefore, they approach the subject from two different perspectives. The first three chapters are by Dr Waldron. 2. Gippsland Panthers and Mascot Mayhem. Dr Waldron sees the Tantanoola Tiger as the beginning of a pattern involving the psychological aspect of the alien bush impinging on the cultivated lands, economic depression, and widespread stock losses leading to panics over alleged alien predators, each time culminating in the killing of a large, aberrant dog. He provides a long series of such panics, far too many to list here, mostly in Victoria, but also theYengarrie Lionin Queensland. All this was against a backdrop of floods, Depression, stock losses, and war - the latter introducing a mania for military mascots. In fact, one returning troopship searched by Customs, was found to contain 1,650 (!) illegal animals on board, including a deer and a bear cub [p58]. 5. Field Signs, Kills and DNA Testing. Here Mr Townsend provides an excellent review of the sort of evidence available, or potentially available, in the investigation of alleged alien big cats. From the discussion, and the endnotes, it is clear that he has done his homework exceedingly well. He delves into tracks, drag marks, territorial markings, denning sites, kills, and sightings and photographs, at all stages outlining the ambiguities of the evidence, and the known problems with eye witness testimony. From there, he discusses in detail the suspects, ranging from the least likely to the most banal. Finally, he discusses the techniques necessary for proper investigation. Notably, he proposesnosolution, although he is sympathetic to the big cat hypothesis. Minor Criticisms.The name of the father of cryptozoology, Dr Heuvelmans occasionally gets misspelled. There is a really bad misspelling of the scientific name of the brush-tailed possum on p 133, and in chapter 3 there is a tendency for capital letters and full stops to drop out. Also, although when the second author cites zoological names, he correctly capitalises the generic name (the first name), the same cannot be said of the first author. This is a common mistake among non-biologists, but an inconsistency like this is a reflection on the editorial proof-reader. 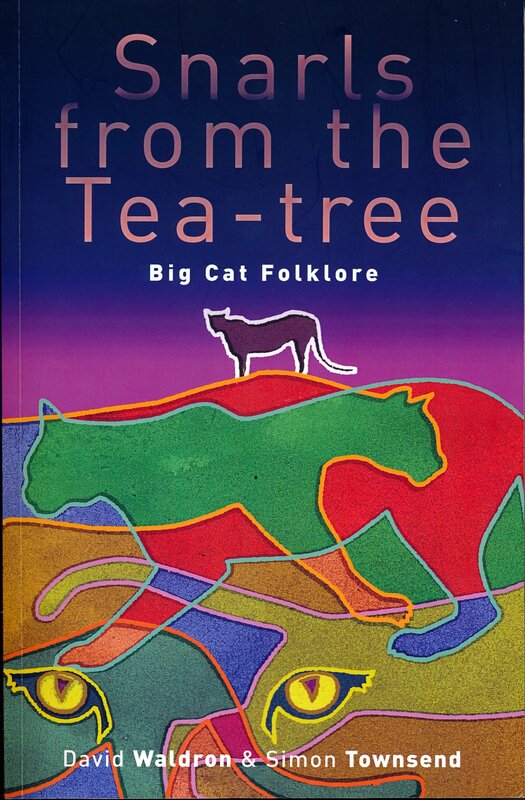 Snarls from the Tea-Tree: Big Cat Folklore. By David Waldron and Simon Townsend. Australian Scholarly Publishing, Melbourne 2012. This book is an intellectually adventurous examination of records of sightings (and the occasional capture) of large introduced cats (of the family felidae) in the Australian environment. It presents with a unique combination of authorship: David Waldron as a professional historian and anthropologist, and Simon Townsend as a significant cryptozoologist, writing their different chapters. Rather than simply rehearsing the well-known twentieth-century big cat scares—such as the Tantanoola tiger—Waldron has dug deeply into the nineteenth-century records of big cat sightings, as well as 20th century reports and oral history accounts, placing these sightings and reported stock killings in their historical, social and cultural contexts. He considers Reviews 175 the mythology that develops from reported big cat sightings as reflecting prevailing mythologies about the Australian environment (both in terms of the ‘wildness’ of the bush, as well as the problems of establishing and maintaining European agricultural enterprise in a new, and frequently harsh, environment), as well as the development of specific mythologies about the zoological denizens (real or imagined) to be found therein. Waldron having supplied the detailed record of sightings, both authors, from their different perspectives, examine the possibility that big cat sightings are not sightings of introduced placental carnivores, but the continued existence of recently extinct, or more distantly, but still historically, extinct marsupi-carnivores (such as the Tasmanian tiger, Thylacinus and marsupial lion, Thylacoleo) or even the possibility of the existence of still scientifically undiscovered, large indigenous marsupials. Waldron details the unrestricted 19th century import of exotic species into Australia, their advertised sale, and representation in travelling circuses, and travelling menageries displayed at agricultural shows (and the occasional escape of stock therefrom, with the occasional live recapture and killing thereof). These incidents undeniably establish the existence— even for just a short period of time—of big cats roaming the Australian countryside. He also discusses the variety of exotic military mascots, held during both world wars, and their possible release into the Australian environment, given the official demand for their destruction because of the risk of their having imported human or animal diseases. Townsend, in his turn, takes a reasoned approach to cryptozoological evidence collection, and the likely confounding alternative explanations to records suggesting big cat existence. Refreshingly, he writes without a chip on his shoulder, an unfortunate characteristic of much of the published cryptozoological literature, whose authors feel (not, it must be admitted, without reason at times) that their work is ignored by professional zoologists and relevant public service bureaucrats. Townsend makes a strong argument for the importance of cryptozoology to professional zoological endeavour, on the basis of recent, large new species discoveries, while recognising the limitations of the lay observer (and the existence and actions of deliberate fraudsters). While demanding serious professional zoological acknowledgement of cryptozoology, as part of the necessary openness to evidence of scientific endeavour, he also calls for more serious, professional behaviour in the process of evidence collection by amateur cryptozoologists (and offers some suggestions on methodologies to improve their record of accounts and evidence collection). This book, placing cryptozoological records in their historical and cultural, as well as scientific, constructs, serves as a most desirable model for any presentation and analysis of cryptozoological data, in its demonstration of the importance of professional historical, as well as zoological, investigation of cryptozoological claims. One aspect of cryptozoology that I (and some other researchers) tend to harp on is that mystery animals must be studied with two lenses: a folkloric lens and a biological lens. All mystery animals are folkloric, whether or not they are biological. Listening to witnesses, evaluating patterns, distinguishing mistaken identifications, even sorting out our own speculation, invariably involves folkloric interpretations that we may or may not recognise. There is far too much conclusion jumping in cryptozoology when it comes to promoting the biological reality of certain cryptids or specific identifications (ie. favoured theories). Worse, there is a false notion prevalent that its folklore versus biology - that if stories of an alleged animal are "folklore", then it cannot be an unknown species. So, it is refreshing to see a book in which both sides are represented, providing a broader and more illuminating discussion of the controversy. This particular book tackles the phenomenon of "big cats" in southeast Australia. Now whether or not Australian Big Cats (ABCs) are cryptozoological (and I think a good case can be made that they are, unless we are going to dismiss a priori certain candidates), they certainly incorporate all of the features of a cryptozoological mystery: allegations of population of unknown species supported by often ambiguous or circumstantial physical and testimonial evidence, creating a distinctive presence in popular culture. The two authors show the parallel sides of an investigation. Dr. David Waldron lectures in History and Anthropology at the University of Ballarat, and provides the folkloric perspective on these creature accounts. Simon Townsend is a big cat researcher (co-founder of Big Cats Victoria) with practical zoo experience, and discusses the scientific direction needed to investigate sightings and alleged kills. Waldron discusses the big cat stories from their earliest accounts, noting personalities, major flaps, and the cultural fascination surrounding them. He delves into o the folkloric origin stories (where the "pumas" and "panthers" may have come from) as well as folk knowledge (inaccuracies included) regarding these animals and their depredations. There are numerous points of tension where different perspectives find themselves in conflict: believers vs. skeptics, fact vs. embellishment, nature vs. society, etc. Each side brings their own interpretation of events and data, and as folk beliefs form and gel, these create an environment where similar beliefs proliferate, regardless of their accuracy. Townsend introduces the reader to the scientific methodology behind cryptozoology, showing how it can be applied to gather and analyse forensic data. He then covers the types of evidence that have been linked to ABCs (including an honest evaluation of the contributory value of such evidence), the various candidates proposed as explanation to the problem and the strategy that should be utilised when undertaking further field investigations. I think this volume is an excellent model for future books looking at cryptozoological problems. We've seen some crptozoology books in recent years coming from sociological or anthropological perspectives, but they rarely have a solid (and objective) biological accompaniment. And, no surprise most cryptozoology books don't have a good grasp of the folkloric atmosphere that surrounds mystery animals. One doesn't have to believe (or xxxx) in order to investigate - but we should certainly be aware of cultural influences on cryptozoological material. This 190-page text includes index, endnotes, and a few photos. It should be of great interest to anyone interested in Australian cryptozoology, or the intersection of folklore and practical cryptozoological investigation. It can be acquired from certain Australian booksellers including Readings (www.readings.com.au) and Abbey's (www.abbeys.com.au), or directly from Australian Scholarly Publishing (www.scholarly.info). For many years there have been reports of mysterious animals in the Australian bush. These include mythical creatures such as the bunyip and yarrie, but also supposedly extinct marsupial carnivores - the Thylacine and the Marsupial Lion. A third group of animals reported from unusual prey kills, footprints and sightings comprise panthers and other 'big cats'. Lobbying of politicians resulted in the somewhat surprising announcement by the newly elected Coalition Government in Victoria to honour an election pledge presumably to rural constituents, to order that a desk-top study be undertaken to evaluate the evidence for big cat presence in Victoria. Not surprisingly, the report found there was no irrefutable evidence in favour of panthers or the like in Victoria; of course this is hardly unexpected - after all, how do you prove a species is NOT present? The report did, however, document sufficient unexplained observations to whet the appetite of big cat proponents and crytozoologists alike! The book is interesting in that it does not come out stridently in favour of one outcome or the other. Instead, it is presented in two parts - the first by David Waldron, a researcher from the University of Ballarat who specialises in the interconnection between history and anthropology and who is interested in folklore and the development of myths. In essence, Waldron's chapters explore the historical context of big cat sightings and provide plausible explanations for the development of the myths that surround this topic - and how they have been reported (or misreported) in local media. The second component is written by Simon Townsend and it essentially documents the cases for big cat reports. The book is very readable and contains some interesting stories. The most famous might be about the Tantanoola Tiger, which apparently caused panic in south-east South Australia through savage stock killings over four years from 1892. Settlers blamed a tiger that had perhaps escaped from a zoo, others an Assyrian wolf and others a Thylacine (local souvenir shops still feature the Tantanoola animal as a Thylacine). In the end a large, feral crossbreed dog was shot and its stuffed carcass is on display at the local pub! Nonetheless, some killings supposedly continued but the authors claim these perhaps were used to cover up widespread stock stealing going on at the time. Another case examined in some detail in the book refers to the release in the Grampians of a pet panther by US servicemen at the end of World Ware II. It is somewhat a stretch of the imagination to believe that this animal and its progeny continued to kill animals over an increasingly wide area for decades. Nonetheless, there is proof that servicemen did indeed have pet mascots for their regiments - a RAAF pilot had a lion cub; a seaman a tiger cub aboard HMAS Australia; an engineer a pet leopard; and US Marines had a pet lion cub. At the end of the war, apparently, many Australians returning home brought with them an exotic collection of monkeys, bears, deer, dogs and a whole menagerie! Indeed, one transport vessel was 'boarded and searched by customs to find over 1650 animals on board including a deer and bear cub' (page 58). So it is easy to understand the potential for these animals to be dumped in the bush rather than put down as demanded by authorities. So what is the conclusion from most big cat kills reported? The authors do not rule out the possibility of sheep and kangaroo being attacked by panthers, lions or other predators, but find that most reports are explained by the presence of large dogs. Thus 'during the 1940s and early 1950s claims that the Victorian countryside was home to a population of large cat-like predators continued unabated despite the official consensus in the mainstream media and government that mysterious stock kills and sightings were, in fact, wild dogs or dingoes. A pattern had become firmly established in Australian culture of big cat panics occurring during times of perceived wild dog/dingo epidemics and mass stock losses with the panic being resolved with the presentation of an oversized canine to the media and government as the 'true' culprit and source of the panic' (page 66). The book is not without its faults. It essentially reads as two small books bound together under the one cover. It is in need of a thorough editing to correct grammatical mistakes, bad spelling (130 angels instead of anglers brought a smile) and omission of punctuation that leads to ambiguity. However, as one of the few comprehensive documentations of big cat evidence in Australia and presentations of interesting anecdotes throughout, it would make a most enjoyable read for naturalists and those interested in the folklore surrounding the Australian bush.